While I was in SF last week I went to Park Tavern with some friends. Below is picture of the restaurant. On the menu is Poulet Noir. Sounded good, but did not want to wait 30 minutes for the meal. Curious I found the recipe for the Park Tavern Poulet Noir. Looking at the recipe it looked like I could do it. One of the recommendations is to use a Staub vertical chicken roaser which is what I use in my weekly chicken cooking. Below is a 5lb roasting chicken. the Park Tavern has a 1 1/2 cornish hen. They do a better job of presentation. I’ll think about taking the roasted vegetables and place them in the roaster. I’ve been on a family vacation and haven’t written lately. Coming back home I needed to do a Costco run. Today I decided to use my RadWagon Electric Bike. At first I was going to just get a few things, but then I saw the white basket I could put on the bike rack and try to take a few more things. Being spatially aware I shopped at costco for things we normally get. What I wasn’t expecting was how many Costco Employees came and talked to me while I was loading the bike. One of the workers took lots of pictures and wanted my name to share that the bike rack is being used. If you go to Costco I bet you don’t see bike racks. The Redmond Costco has bike racks given the City of Redmond required them and even helped specify the ones to use. I don’t think I have ever seen a bike there until I was there. Below is a picture of the bike back home in the garage. It was a 6 mile ride to Costco. Takes about 20 minutes. Here is the stuff I bought. I need to work on a better way to mount the basket I put on the last minute if I want to do this on a regular basis. My wife and her friends get a good laugh at my Costco run using the electric bike. I cook often and use my pizza oven 2-4 times a week. I’ve written blog posts in the past, but sometimes a video explains more. 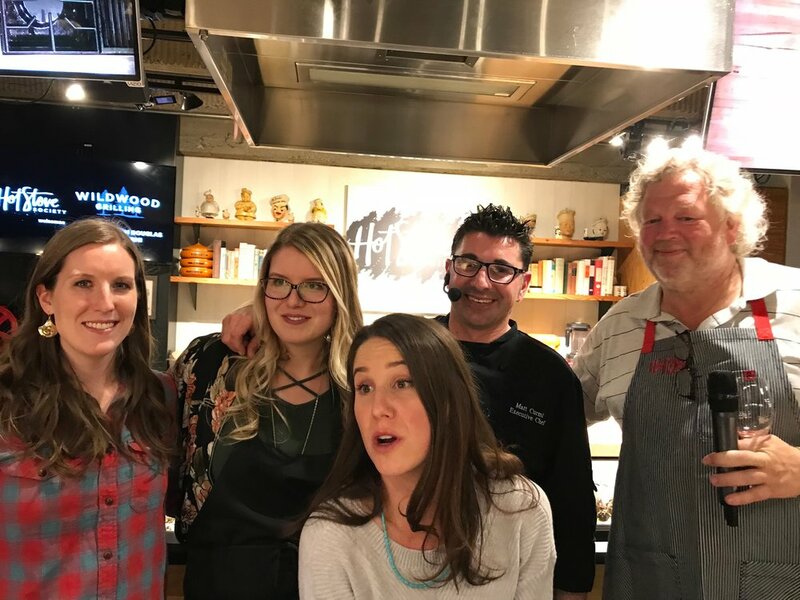 Seeing the food and hearing it cook connects me to the experience. Below is a video of a pepperoni, brussel sprouts pizza. the sprouts are precooked in the drippings from a roasted chicken. After years I've finally made my pizza as good as Serious Pie. At the beginning I didn't make my own dough. Now I do and it isn't that hard, making 12 dough balls in two batches and freezing the dough. 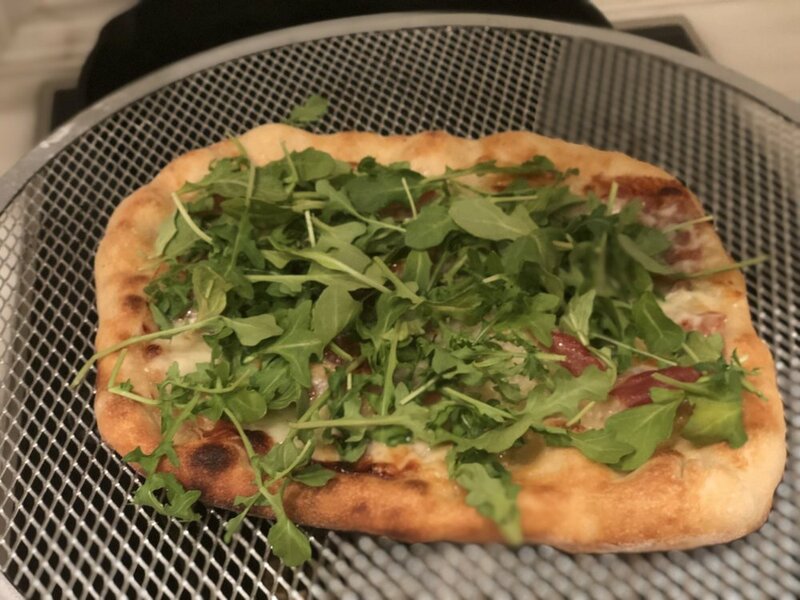 First what is the pizza dough recipe I use. Woodstone's home recipe which is here. I may try to use an old dough like in the restaurant version which is here. Meeting Tom Douglas I asked him about what I needed to work on for better pizza and he said it was all about the crust. My pizza was good, but not great. Something was wrong. Watching Alton Brown's old show Good Eats I figured out. My yeast was old. The recipe only asks for 1/2 teaspoon so you tend not to think about it. Got new yeast and yep dough is so much better. Below is after I let the dough defrost from the freezer and rise at room temperature. Tip: don't keep your yeast for more than 12 months, may only 6. You can test the yeast and see if it is still active. If you want to get other tips on better dough Woodstone has this link. One of the most frequently asked questions from both our residential and commercial customers is: “How do we get thinner/thicker/better dough for our pizza?” Here is what we know. The Wood Stone dough recipe (found on the recipe page) is easy to work with, creates a fairly thin crust if desired and is very moist without sticking to your work surface. If this recipe is not what you are looking for, use the recommendations below to try different levels of protein and gluten. The proportions should not change although if you prefer less-chewy dough you could use all bread flour (no semolina) or substitute all purpose flour for the semolina. Crispy Crust (thin or thicker crust): Lower gluten (as low as 7.5% is available), a wetter dough (without being sticky), protein content can be the same or lower (for less chewy dough), and oven temperatures between 550-600 degrees. Minimal toppings and sauce: the more “stuff” you have on the pizza the longer it will take to cook and the less crispy it will be. Cracker Crisp Crust: low protein (10.5-11.5) low gluten flour, longer mixing time (12 minutes) better developed dough. Thick and Chewy Crust: Gluten in the range of 12-13% and a bit dryer dough, higher protein as well as a lower oven temperature (525-550 degrees) and longer cooking times (6-9 minutes). Use a larger dough ball if using our dough. This is a good style if you like more toppings and sauce on your pizza. Lower Protein Crust = All Purpose Flour will be better here, giving a less chewy dough. More Gluten Crust = Softer dough and good for thicker or more bready crust. Less Gluten Crust = Crisper and good with thinner cracker-like crust. makes up 1% of our ingredient profile. Yeast (very small amount for a slow, refrigerated, 24 hour rise). Wood Stone uses General Mills (Gold Medal Superlative Bread Flour) and Semolina. They have a variety of options for less gluten as well. King Arthur makes a variety of bread and all purpose flours. They also have Italian Style flour with 7.4% gluten. Pillsbury has all-purpose flour with 10-11% gluten and bread flour with more gluten that will still give you good “chew”. Keep your sauce, cheese and toppings to a minimum. Putting a lot of sauce on your pizza will make your pizza soggy; a lot of cheese will make it greasy and heavy; overloading the toppings will weigh down the pizza. Transfer the pizza from the oven to a “pizza screen” or baking rack before putting it on a cutting surface. Let it rest for 1 minute to set the ingredients before cutting. The screen will keep the pizza from steaming and getting moist on the bottom. This is also a good way to cool a pizza if you don’t plan on eating it right away. Keep your work surface clean of moisture and debris. Have all your pizza ingredients prepared ahead of time and close to your work space. Roasting vegetables and other ingredients before putting them on the pizza will give your pizza better flavor. If your dough is over proofed (bubbly, sticky and is tearing) it will be hard to get the desired results. If you use a 24 hour rise dough, it is important to hold the dough in a cold refrigerator or it will proof too quickly. Bringing dough to room temperature for 30 – 60 minutes will help the dough brown better in the oven. This weekend my wife and I attended a Hot Stove cooking event where Wildwood Grilling had a smoked cooking event. Below is the Wildwood crew with Tom. 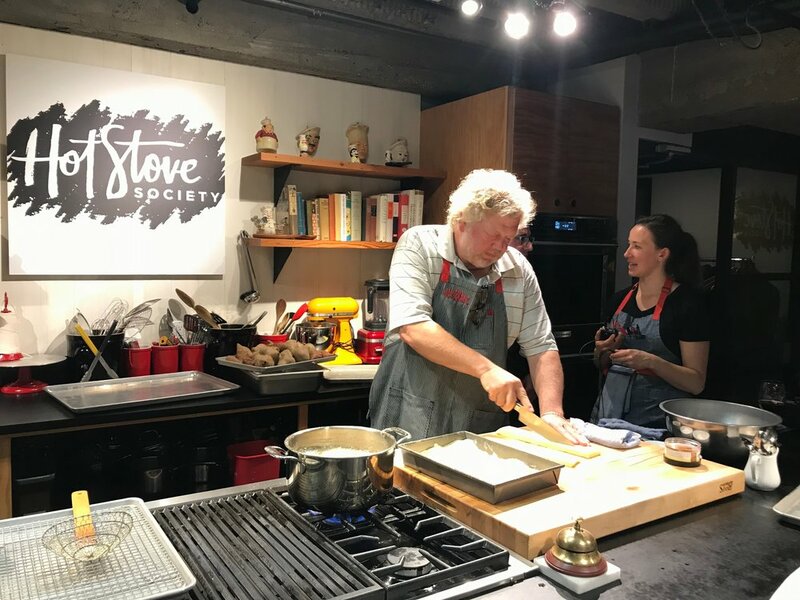 What was a pleasant surprise is how much time Tom Douglas was there hosting the cooking class. With Tom Douglas in front us I figured it was a good chance to get cooking tips from a top chef. Tom has two awesome pizza restaurants in Seattle. So I decided to talk to Tom about pizza. What should I ask? I went up to Tom. And told him, "I have a Woodstone Oven at home (which is the same as what he has in his restaurants). I make my own dough. What should I do to make pizza at an advance level?" Totally agreed. But he was busy with the cooking class. I tried looking for a downtime when I could follow up. So food is on the table. We are all eating. Then Tom comes over. Pulls me to side let's talk. I knew Tom's time is valuable no different than any top executive, so needed to quick and go with his thoughts. We discussed dough time high gluten vs. low gluten, oven temperature, how long to let the dough rise, stretching the dough, how to cook without the cheese for 3/4 time then finish, his attempt at patenting his pizza trays and how he retains heat after removing from the oven versus the common practice of putting the pizza on a grated surface to reduce moisture. I think the discussion was maybe 3 minutes. and what Tom shared will give me months of ideas to experiment with as ultimately I need to find my own way to make advanced pizza. Pizza that has a great crust. Below is a picture of one of my pizzas. I think I am pretty close, but always can do better.